Disrupting Uke’s Balance: Effortless Aikido and the Tenshin Movement ~ How Do You Marry an Attacker’s Striking Intention with His Nearly Immediate Arrival On the Pavement? So what is the secret to effortless aikido? If I could be so presumptive to point you in a direction, I would say, the secret is contained in your very first movement ~ which is never confrontational, but always breaks uke’s balance, and allows powerful technique to flow forth without effort. 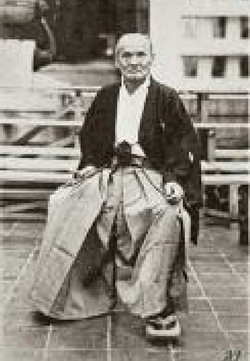 Now Nihon Goshin Aikido Aficionados that we all are, we certainly know a thing or two about breaking uke’s balance. Consider your earliest remembrance of the Elbow Chop. In the “This is how you do it” explanation, you’ll remember your sensei pointing out that “with proper distance between uke and nage, all nage has to do to disrupt uke’s balance is simply raise his gripped hand.” (Premise tested: “The essence of effortless technique is the first movement”). This simple, effortless motion of raising your gripped hand like you’re raising a sword, pulls uke’s weight slightly forward onto his toes (thereby unbalancing him), allowing the rest of the technique to flow effortlessly. When you get good at the Elbow Chop, it becomes a single, smooth engine of destructive energy. All at the same time, you raise your arms and drop your one point, as you begin to drop back into an extended hamni. The snap of your hips to turn your orientation a full 180 degrees is perfectly timed to match your chopping hand’s contact with the inside of uke’s elbow as you establish extended hamni. All this effects the launch. Now when you get to this point, you’re done, because uke is simply no longer attached to the earth’s surface. Sure, you’ll catch a glimpse of him flying by your shoulder, and then he’ll hit the mat in front of you an instant later ~ sometimes longer. That is it. 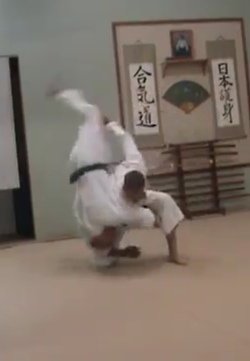 That is kuzushi (Balance breaking), and what follows forth is powerful technique; in this case the Elbow Chop Classical Technique. Now the Tenshin movement accomplishes the same balance breaking idea also allowing powerful effortless technique to devastate uke, but there is a key difference. With a Tenshin movement, uke’s balance is broken in a different direction relative to nage ~ which is why it is of particular interest to me. Unique to the tenshin movement, uke’s balance is broken directly in front of nage. So let’s discuss particulars. I’ve done my best to document the movement in Microsoft Paint. So consider my crude footwork drawing to the left. 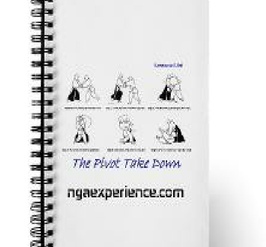 The black feet represent Nage’s initial stance. The gray feet are nage’s finishing stance. The red arrow is the intention of uke’s strike. 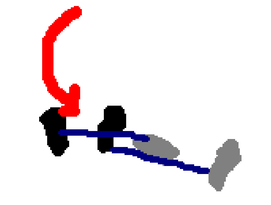 As you can see, the right foot is moved first (slightly back and directly away from the strike), and then the left foot is drawn back into a left hamni. Your finishing position is slightly back and offline. Now if you move into tenshin correctly, uke will be completely off balance and his kuzushi will be so badly disturbed that he will even occasionally just crumple at your feet if you only pull uke’s striking hand into your center. Uke Down ~ Fight Over. To my eye, the movement most closely resembles the footwork for the Reverse Wrist Technique (and the distance between uke and nage at the finish are similar), but even the casual observer will note that the footwork is notably different. In the Classical Technique of the Reverse Wrist, when moving to your right, the footwork would have you finish in a right hamni stance, but as you can see in the tenshin movement, the footwork places you in left hamni (the exact opposite stance). As I said, “it’s similar, but still different.” This is NOT an accusation. By all means, if anything I see the understanding of the Tenshin movement as an opportunity. The tenshin movement adds another arrow to your proverbial aikido quiver ~ a way to send uke flying off in a “new and unexplored” direction using the same trusty 50 techniques we’ve always used! Variety ~ it’s the spice of life. Now how does it work? Well, I’ve attached a video that demonstrates the Tenshin blending movement in reaction to various strikes (mostly round, but not always). Lots of applications of our 50 techniques follow from that initial tenshin movement. Rather than focus on the implementation of technique however, focus instead on the first movement and how that tenshin movement leads to uke’s kuzushi which makes effortless technique possible. Pay close attention to how disturbed uke is as the energy of his strike is carried past the point of his original intention due to nage’s tenshin blend. In my mind the tenshin blend does not simply disrupt uke’s balance, it destroys uke’s balance. 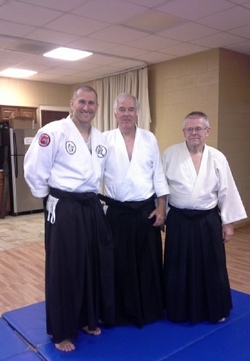 Sensei Darrell Tangman (aikikai) out of Augusta, GA showed me the Tenshin movement last December on one of his regular trips to Columbia, and I remember thinking, “I need to remember this concept.” It was such a unique movement to me initially, in that it felt completely foreign. In fact, Sensei Lamar Sanders (aikikai) showed the same concept to me probably a year prior, but I just could not get it in my head at that time ~ so in my second experience, I felt like I had to get it right. The Tenshin Movement ~ modified to operate out of a shizentai stance. It is a movement back and off line, offering tremendous kuzushi opportunities. The Tenshin movement works especially well against round attacks. Note how nage controls uke’s striking hand past the center line and into kuzushi.